Donald Trump’s plan for plunging America into barbarism. The GOP front-runner’s plans to prosecute the war on terror are sickening. 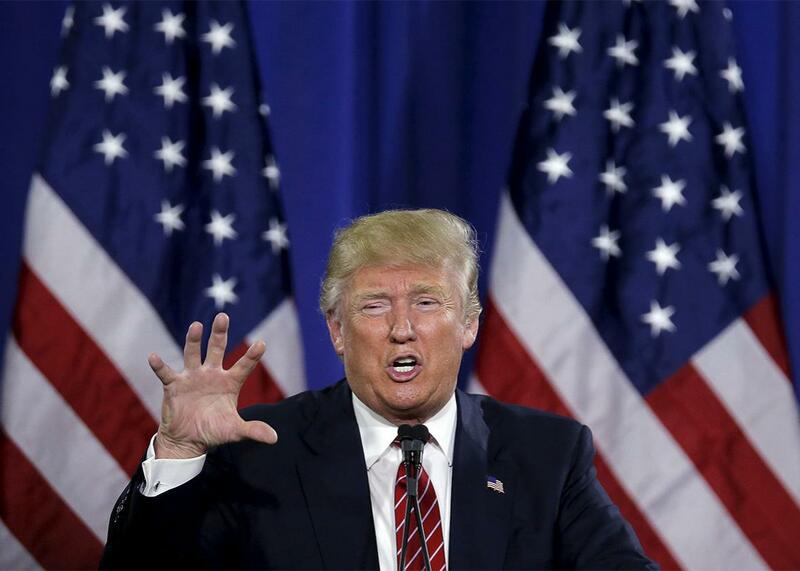 Republican presidential candidate Donald Trump speaks about the size of his hands at a campaign rally in Cadillac, Michigan, March 4, 2016. How does an enlightened nation descend into barbarism? That used to be a question for historians. Now it’s a process you can watch in real time. In recent days, Donald Trump has been casting aside moral constraints on torture and violence against civilians. At his campaign rallies, crowds have cheered him on. What kind of country would the United States become if Trump and his followers get their way? Just listen as Trump spells it out for you. 4. Hostage taking. Trump says he would target terrorists’ family members because they’re the people terrorists care about. On Dec. 6, he said on Face the Nation that although terrorists “say they don’t mind dying … I can tell you this: They want their families left alone.” At a Republican debate on Dec. 15, he added: “I would be very, very firm with families. Frankly, that will make people think, because they may not care much about their lives, but they do care, believe it or not, about their families’ lives.” The audience applauded. The next day, Trump repeated that terrorists “care more about their families than they care about themselves” and that he “would do pretty severe stuff” to a terrorist’s wife. The crowd roared its approval. 5. Religious war. Trump routinely demands payback against ISIS for killing Christians. “The enemy is cutting off the heads of Christians and drowning them in cages, and yet we are too politically correct to respond in kind,” he wrote in a USA Today op-ed on Feb. 15. Often, Trump mentions that ISIS kills other people, too. But the only victim group he identifies by name is Christians. Dickerson: Isn’t that separates us from the savages—rules? Trump: No, I don’t think so. No. We have to beat the savages. Dickerson: And therefore throw all the rules out? Trump: No. We—well, look, you have to play the game the way they’re playing the game. You’re not going to win if we are soft, and they are—they have no rules. Now, I want to stay within the laws. I want to do all of that. But I think we have to increase the laws. You can see where this line of thinking would take us. To even the odds—to equalize the rules—we would have to behave like ISIS. Trump thinks about the laws of war the same way he thinks about trade barriers: The only way to get a level playing field is to do to others what they’ve done to you. 9. No limits. Trump rarely specifies what he would do to terrorists’ families. On Dec. 6, when Dickerson asked Trump what he meant by “going after the families,” Trump told him, “I’m going to leave that to your imagination.” In a Dec. 16 interview, O’Reilly asked Trump, “You’re not going to assassinate them, are you?” Trump replied, “I don’t know what I’d do.” Trump keeps his answers vague on the same grounds he uses to justify his vagueness about future military action: He wants to keep the enemy guessing. In both cases, the effect is that Americans have to guess, too. Some day, God willing, that’s where Trump’s ruthless ideology will end up, too.